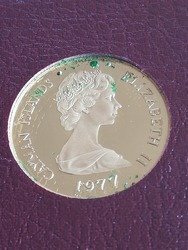 Cayman Islands Gold Queens coin - advice please! 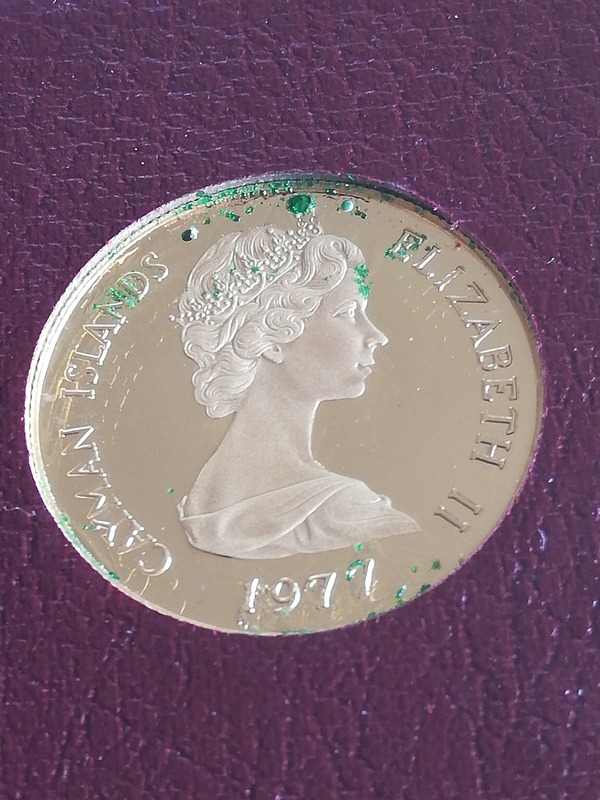 I am lucky enough to have the Cayman Islands Sovereign Queens Gold Collection from 1977 and one of them is struggling more than the others. What is the best course of action to help me with this? I am conscious of the coins not being 100% gold and wonder if this is happening to the other materials mixed in, of which I haven't determined yet what they are. Of the six, this is the worst and 2 have slight green appearing on the rims where it touches the maroon backing board. I can safely get it out of the case and store away from the maroon board. Is this something I should do? I only have self adhesive 2x2s to put them in if I do. Any help that can be offered would be great thanks. ​Yes, this series has only a gold content of .500, but to be honest your coin doesn't look like a gold coin at all, not even a .500 gold coin. Can you provide pictures of the reverse too, and if possible from all six coins of this series? It's a pity, it's a nice coin but that green stuff makes it very ugly now. I strongly advice to get it out of the maroon board. As you can see, that green stuff always start on the rim, where the coin makes contact with the board. Your 2x2's are much safer. Thanks for the reply, its the photo making it look pale, its definitely gold looking, has the certificate and is still with the original owners family. Fairly confident about it being legit, more concerned with what to do to stop further damage, and is it worth using careful measures to remove some of the green, it appears to be sitting in droplets on the top. I'm not a fan of cleaning but does this warrant a bit of intervention? Such beautiful coins, I don't want to make a mistake. You should immediately remove the coin from the mint packaging and soak it in acetone. Probably a .500 Silver coin, or a silver plated one. This looks like some 1970s Franklin mint chintz. Any base silver coin will have a copper base. Even fine gold and silver has copper as a hardening agent. Pure silver and gold are very soft and malleable. But 90% silver would not leach verdigris like that, that coin is 50% at most. I love coins, both old and precious and also change coins. If its round and shiny, it will garner my interest. I also collect stamps and have an abiding interest in History, Archaeology, and Social Issues. I also worship the musical god Prince.